I had the most fun over the weekend. A friend called me a few weeks ago. She was standing in Joann's telling me how she had volunteered to make a quilt to raffle as their big charity fundraiser. The first thing I said was get your bu?? out of there and get over here. I will say she had no idea what she was doing but knowingKatie that would not stop her. We went through the process and created a game plan. She was armed and ready with a layer cake, fabric marker and a huge bundle of determination and patience. Oh I left out that this is a preschool class with 3-5 year olds. after all do any of us really ever grow up? We were able to sew in in an office meeting room with lots of room to spread out. Moms came and went throughout the day. Kids played in the next room and pizza was ordered for lunch. I guess this would be a modern version of the old time quilting bees. Katie also asked the kids to bring a piece of fabric or clothing that had some memories for them. The sashing fabric was from one of Nate's birthday parties so we quickly turned that into sashing. This is Gus's block. He wants to be a person that talks about old-timey football. 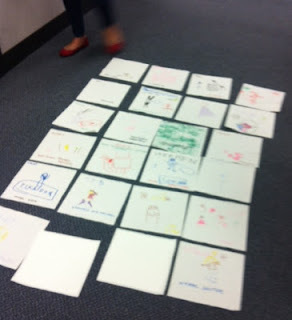 We had fun trying to interpret the drawings. Supposedly the chair he is in is a recliner. 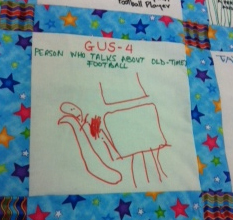 Just wondering if Gus was influenced by a grandfather talking about old time football? Maybe he just wants to be comfortable and thinks everyone should be able to work from a recliner. Lucy- A princess with high heels. From what I gathered from the moms Lucy is very petite but has a huge heart and spirit. She is known to direct the entire class in spite of her small stature. Maybe that is why she needs the high heels. Stephen- A Dallas Cowboy player. There was talk that Stephen's dad has something to do with the Cowboys. Apparently Stephen is very influential in the class because several little boys he plays with also wanted to be football players. Their moms were shocked when they say the quilt blocks. Yep, it must be Stephen is what one mom said. Audrey, Baby Doctor-Mermaid Princess. Audrey is my kind of girl. She likes to keep all of her options open. She is holding a frog/toad button that is wearing a crown. Who knows maybe her prince charming in waiting. Cyrus- A person who catches animals and cares about nature. Nate- A doctor that plays golf. This is the only little boy I knew and at 5 years old he is already a fantastic golfer. Let's just hope the doctor thing works out for him. holding a stethoscope listing to the heart of a dog. Precious! and were also used to piece a great big heart. What I want to be is still undecided. I am thinking a PRINCESS might be nice! Thank you to Katie and the other moms for letting me a part of such a wonderful project. The day certainly brought back great memories of when my kids were young and innocent. My oldest wanted to be a marine biologist because he loved Flipper. Good times!